ETA Katia Oltmann’s highlight this month was holding her local WORDS competition on March 2nd. There were 13 students who participated in the competition, each of whom made a short picture book about their hometown. The competition started after a short speech in English from SMA Kristen Eben Haezar’s new headmaster, Pak Apner. 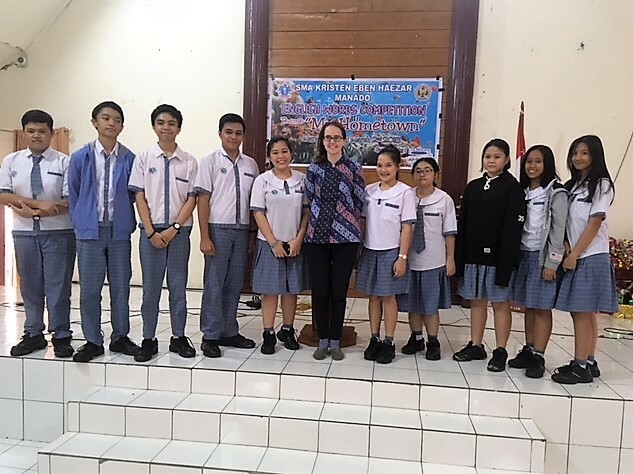 The student who opened up the competition was Juan Tombeng, who wrote a story about a white bear living in Tomohon City. Each storyteller had a large audience, as students from several 10th and 11th grade classes came to watch the competition. The stories varied widely in subject and theme, from the history of the discovery of the Coelacanth (living fossil fish) in Manado to a tale about a bunny who moved from Surabaya to Manado. At the end of the competition, certificates were given to every participant, and the three top performers were given special certificates. The first place winner of the competition is excited to compete in Jakarta this April!